Ahead of the government’s efforts to select a third telco player, the country’s two telecom giants Globe Telecom and Smart Communications are reporting noticeable improvements in the quality of their mobile internet services, according to wireless telecom analyst OpenSignal in a report released on May 29. The report showed that in April 2018, Smart posted an average overall download speed of 7.4 Mbps, almost double the speed it recorded in May 2017 at 3.8 Mbps. Meanwhile, Globe’s average download speed was 4.9 Mbps by the fourth month of the year, or 57 percent higher than its recorded speed in May 2017. 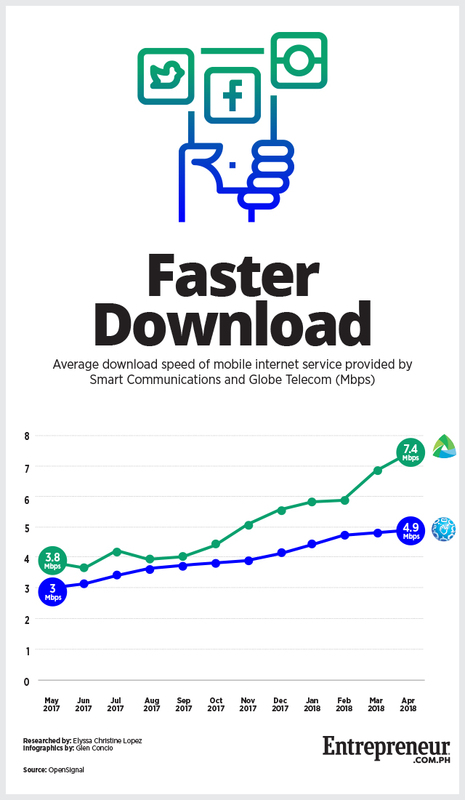 From February to April 2018, OpenSignal closely studied the average overall download speeds for Globe and Smart’s mobile internet service. These included 4G and 3G download speeds and their customers’ level of access to each type of network. Of the two, Smart recorded faster improvements since March 2017, completely pulling away from its competitor by the start of the third quarter last year. OpenSignal attributes this to Smart’s massive investments in 4G and LTE network expansion. Since 2016, Smart’s parent company PLDT has been undergoing a network and service overhaul and plans to install 6,800 LTE-equipped cell sites and 8,000 3G-equipped cell sites by 2019. On the other hand, Globe also rolled out its own expansion plans. Early this year, the company tapped Huawei’s latest MIMO (multiple input, multiple output) product, a technology that can boost cell site capacity by two to three times without the need for additional spectrum. These aggressive efforts of both companies come amid the government’s moves to attract a third telco player to enter the industry. President Rodrigo Duterte has long criticized the services provided by the duopoly of Smart and Globe and aims to open up the industry, hoping it would lead to better services. However, the government’s efforts to attract a third telco player are facing considerable delays. In previous interviews, Department of Information and Communications Technology (DICT) Officer in Charge Eliseo Rio said the government would have to lift foreign ownership restrictions to attract more foreign players to invest in the industry. With those hurdles still in play, Rio said the third telco player may be chosen by the third quarter of the year, way past the initial deadline of early 2018. Related story: Will Moves to Lift Foreign Restrictions Add to Delays in the Selection of 3rd Telco Player?